All advertised products are Hungry Girl approved! Today's delicious finds are brought to you by Flatout Flatbread. Lightly brush veggies with olive oil, and sprinkle with salt and black pepper. Bring a grill sprayed with nonstick spray to medium-high heat. With the grill cover down, grill veggies for 5 minutes. Flip veggies. With the grill cover down, grill for 4 more minutes. Add flatbreads to the grill, alongside the veggies. Cook, uncovered, for 2 minutes, or until flatbreads are toasted and veggies are tender. Reduce grill to medium heat. 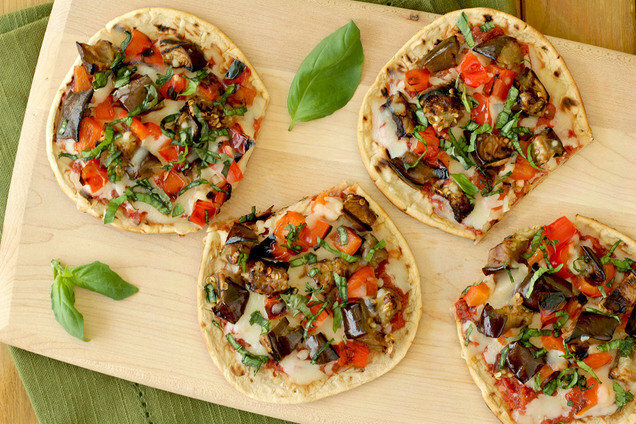 Remove flatbreads and veggies. Once cool enough to handle, roughly chop veggies. Evenly spread seasoned tomatoes over each flatbread, leaving a 1/2-inch border. Top with cheese and veggies. With the grill cover down, grill flatbreads until cheese has melted and flatbreads are crispy, about 2 minutes. Top with basil. 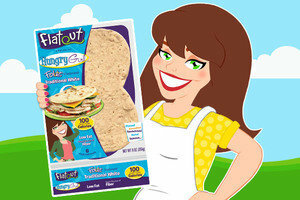 Cut flatbreads in half. Today, June 21st, is National Peaches and Cream Day. Ohhh, how good does this sound? Flatout Foldit tacos stuffed with peaches, vanilla yogurt, and cinnamon!